Born and raised in DC, we are your Washington, D.C. bike crash attorneys. Timmy grew up in DC and became a cyclist in DC. As a Washington, D.C. bike crash attorney, Timmy is here to help. If you have been in a crash please contact us immediately for a free consultation (202) 996-0609 or [email protected]. If you aren't ready to speak with us, learn more about what to do after a bike crash here. Allowed to pass on left or right, in the same lane of changing lanes, or pass off road. No person shall open any door of a vehicle unless it is safe to do so without interfering with moving traffic. Prohibited in the central business district (bounded by Massachusetts Ave. NW, 2nd St NE-SE, D St SE/SW, 14th St NW, Constitution Ave and 23rd St NW). Allowed where posted in this area, and prohibited where posted outside this area. Front white light and rear red reflector (or rear red light) required when dark, may be attached to an operator (rider). Timmy Finch grew up in the DC area and his best job (before joining The Law Office of Peter Wilborn) was his stint as a full-time bike messenger. He knows the city's streets. Timmy is a 2009 graduate of the Charleston School of Law. For his first five years of practice, he was a prosecutor focusing on crimes against women. He has extensive trial experience as a lead attorney and has handled thousands of complex cases of violent crime and sexual assault. As a cyclist and lawyer, Timmy feels a responsibility to help injured bicyclists. 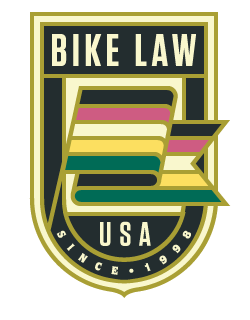 His life long love affair with the bike and sense of justice are what brought him to Bike Law. Timmy has raced on the road and track. Timmy still uses a track bike (and now cargo bike) to get around. Riding is his passion and he rides every day. Learn more about Timmy here.